Alumni with active school email addresses are free to access MyWorldAbroad in the same way as students and staff. If alumni DO NOT have active school addresses, a school staff member (generally an employee from the Alumni office or Career Office) has the ability to register individuals for access. This staff member must first be set up an “Administrator” on the MyWorldAbroad site. These Administrators have access to extra menus in the “Student Advisors” column located in the MyWorld footer (see #1 & #5). Contact our client services department by e-mail to designate a staff person as an Administrator in our system. The Administrator logs in to MyWorldAbroad to access the Alumni Registration link (only visible to Administrators) located under the Student Advisors heading in the site footer (see #1 in the screen shot below). Click on the “Add” tab (see #2). Enter the alumni’s e-mail address in the space provided (see #3) and click on the “Add” button. When entering more than one address, separate the addresses with a comma or insert as a list with one e-mail per line. CAUTION: The system is designed for entering small batches of up to 50 addresses at a time. Pre-registration of thousands of alumni in one batch is not possible at this time. Note that e-mail addresses appear in the “List” tab (see #4) which shows a history of all your previous entries. This list should be cleared at least once a year or after an alumnus has registered. 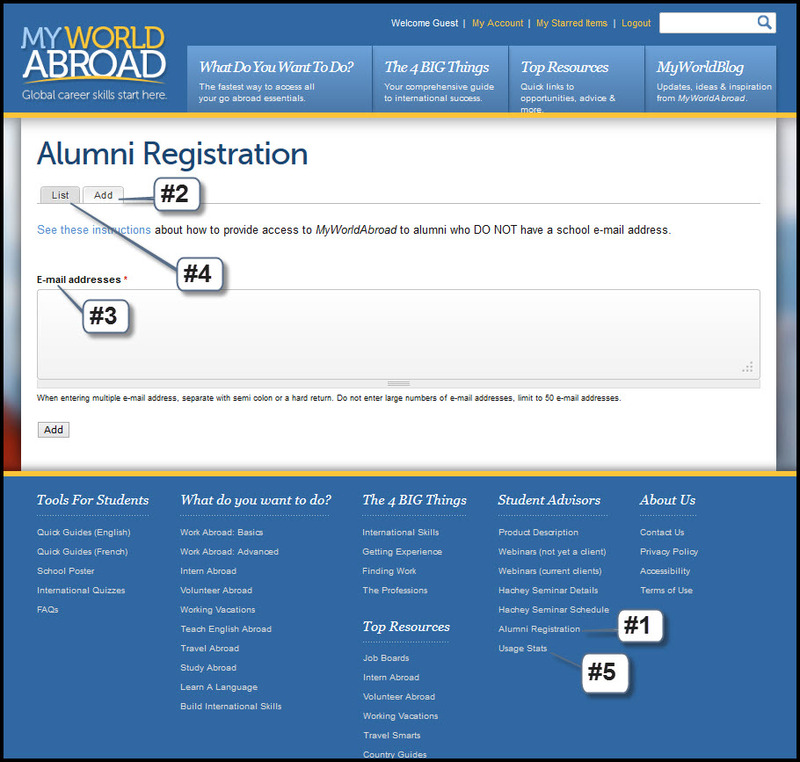 Once the email addresses have been entered, alumni can now follow the same registration process as your students to access their accounts: a) go to www.myworldabroad.com/register (change this URL by replacing "register" with your "school's domaine name") b) on the registration form, enter the Alumni’s e-mail address and choose a password; and c) respond to the activation e-mail sent by the MyWorldAbroad system. You can inform alumni about the availability of MyWorldAbroad in any number of ways: via newsletter, in a publication, via email, mass text or social media. The sample letter below has been created for your use in marketing materials. You can also access MyWorldAbroad images at www.myworldabroad.com/media. Are you interested in having an international experience? Alumni can request access to MyWorldAbroad.com – an online resource containing 300+ expert articles and 4,000+ resources about every aspect of living and working overseas. Send your e-mail address to jane.smith@abc.edu at the Alumni office to get registered. Further to your request for access to MyWorldAbroad, we have now pre-registered you for a user account, giving you full access to the site. Visit www.myworldabroad.com/register (change this URL by replacing "register" with your "school's domaine name"), select our college/university and complete the registration form. You will be asked to enter your e-mail address and choose a password. Once completed, you will receive an activation e-mail that will allow you to activate your account. We hope you find this site informative and we wish you every success. NOTE: Consider changing the above link to www .myworldabroad.com/[your-schools-domain-name] to more easily access your school’s registration page for MyWorldAbroad.